The collapse of the Caroni Bailey Bridge is powerfully symbolic of the pervasive collapse of this society under the weight of the ineptitude of the current Manning Administration. When the centre is not holding together the rest of the country or the periphery is in disarray and slowly disintegrating into managed chaos. Is it not coincidental that it was the centre of the Caroni Bridge that collapsed and brought down the rest of the structure and its human cargo into the murky waters of the Caroni River? I drove past the bridge half an hour before the accident. I witnessed vehicles on the centre of the bridge being loaded with some of the dismantled parts of the floor of the bridge without any cranes present to suspend the main structure. 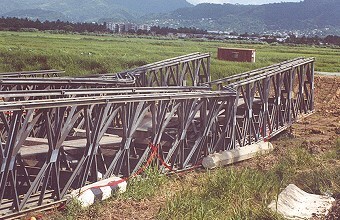 How can Minister Colm Imbert then say in his press conference that the bridge was being placed on wheels to be pulled to one bank of the Caroni River when it was being unwittingly dismantled piece by piece? 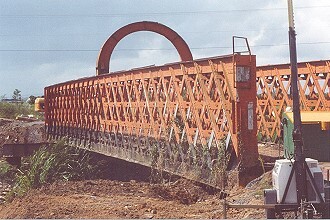 There is no room in the adjoining rice-fields to pull this over one hundred feet bridge to the north side of the river. The push and pull technology is being used on the Uriah Overpass and over the new Mabey Caroni Bridge and not in the old Caroni Bridge. One does not need a rocket scientist to tell us that it was human error during the dismantling process; that the integrity of the bridge worked well from the time it was erected in 1997. Minister Imbert carved a pathetic image in trying to score political points while one innocent workman perished and four others were injured unnecessarily. Please do not remove the old 1883 single-lane Caroni Red Bridge formerly silver built by Daniel Meinertz Hahn because the new English-fabricated, 35 million-dollar Mabey Bridge can collapse at anytime and cut off Central Trinidad.